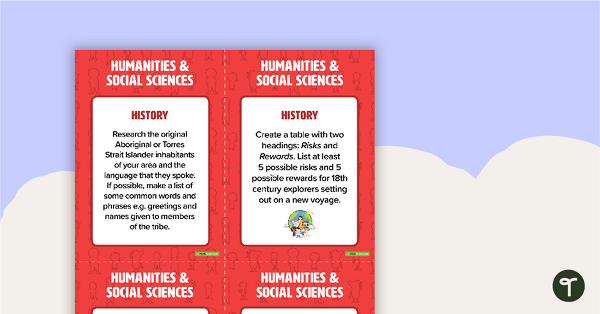 A comprehensive collection of Geography teaching resources. 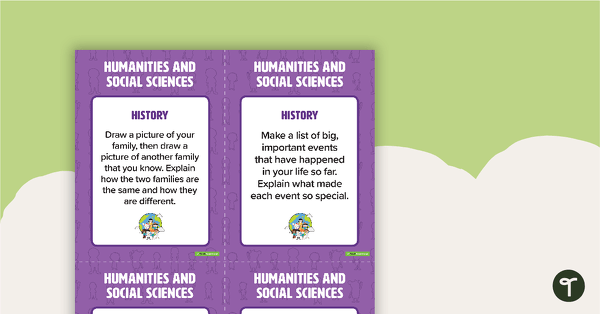 This collection includes a large selection of educational resources such as posters, worksheets, lesson plans, assessment pieces, inquiry tasks, comprehension texts and more! 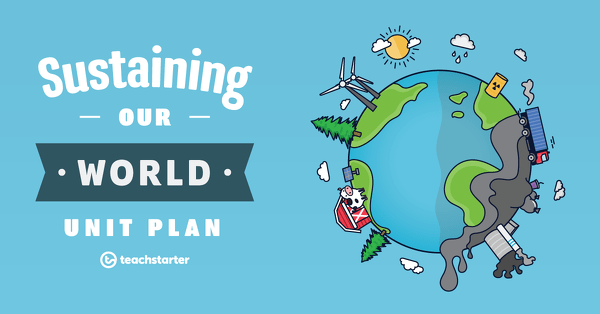 Within this Geography category, you will find resources that support the teaching of the sub-strands which includes countries, environments, flags, landmarks, maps, sustainability, environmental impact and recycling. 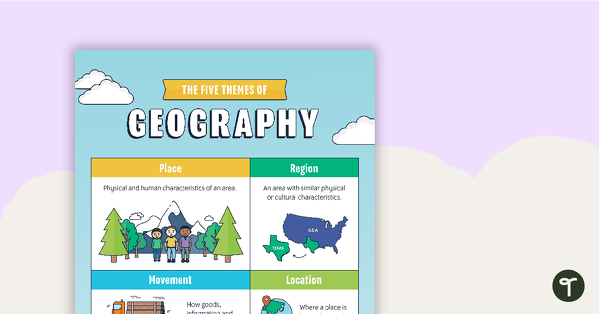 A pack of six posters to use when learning about geography. 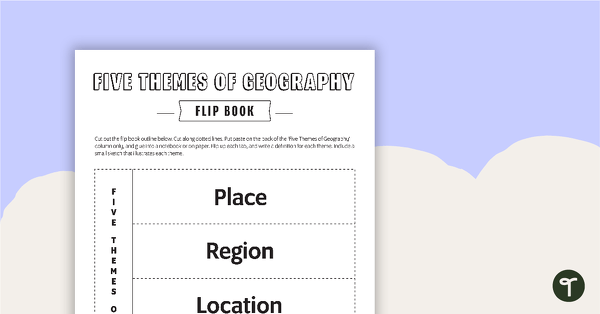 A flip book to use when learning about geography. 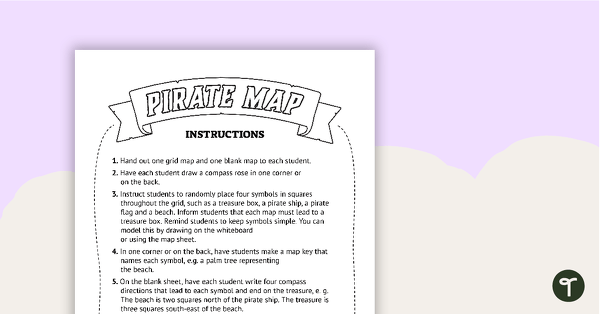 A worksheet to use when learning about basic mapping skills. 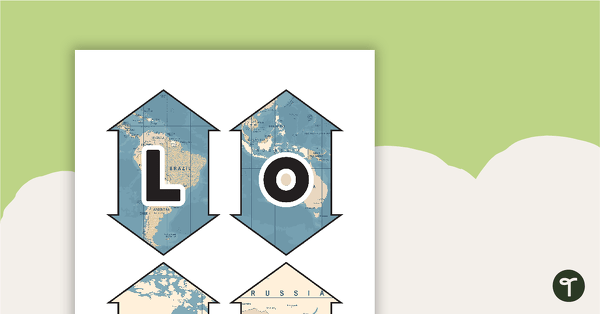 Latitude and longitude banners to display in the classroom when studying geography. A whole class game including a collection of 6 activities which students need to solve to reveal numbers to combine for a lock combination. 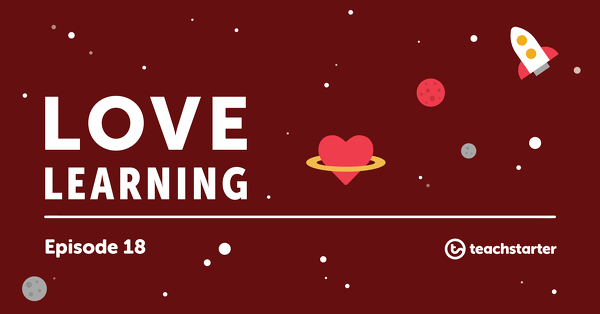 Download the full collection of teaching resources to support facilitation of Teach Starter’s six-step ‘Genius Hour’ inquiry-based learning process. A worksheet to use when exploring grids, grid references and direction. A set of maps to use in the classroom when learning about WW1. Display this poster when learning about sustainability. 10 beautifully designed posters about some of Australia’s most famous natural landscapes. 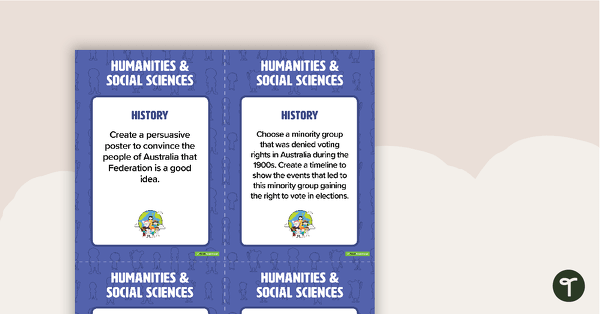 A set of 12 Humanities and Social Sciences task cards. This Geography unit addresses concepts surrounding the sustainable use and management of natural resources. 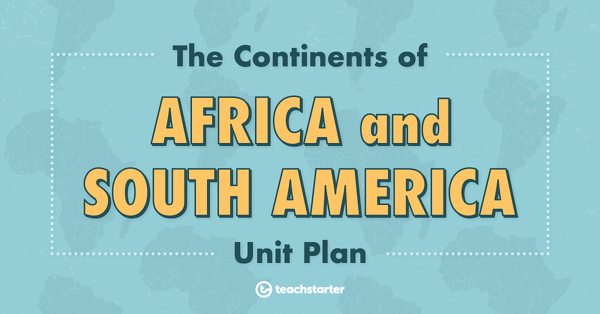 This Geography unit addresses the topographical features and the natural environment of the continents of Africa and South America. 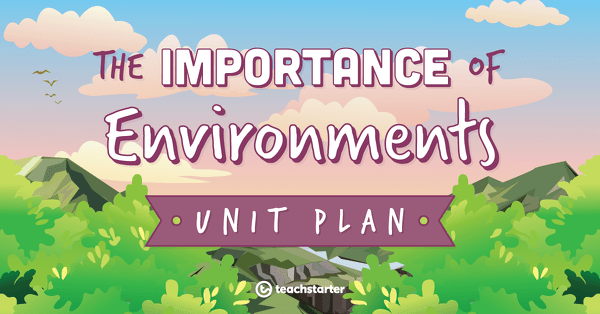 This Geography unit addresses the importance of environments to animals and people and the ways in which they can be protected. This Humanities and Social Sciences unit addresses a range of concepts relating to the natural and human features of Australia. 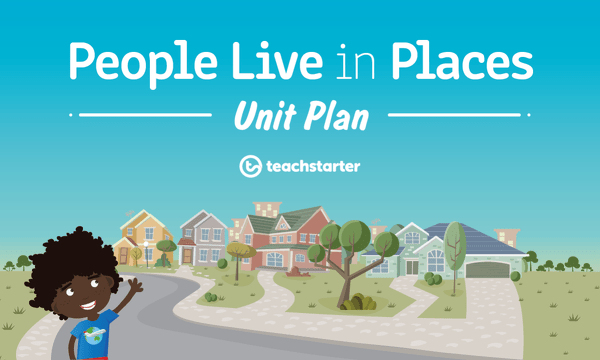 This Geography unit covers a range of concepts relating to the places students live in and belong to. Must have National Recycling Week activities and ideas for the classroom. Get sustainable practices buzzing at your school with our 45 tips and tricks for an environmentally friendly classroom! 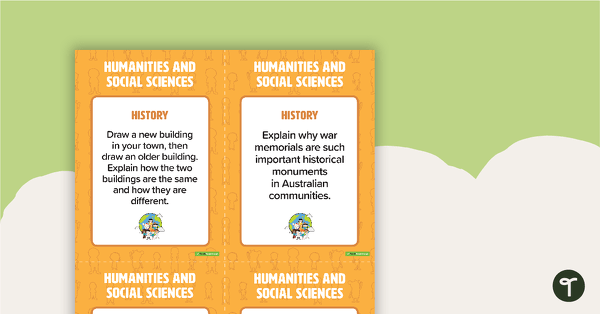 This brand new teaching resource pack will help you support students in their own self-directed, open-ended inquiry projects!